The namesake of Kirker Pass in Contra Costa County, California, James Kirker, has long been a favorite of local historians. This paper is the result of new research from the Contra Costa County Historical Society archives on the final days James Kirker, mountain man and Apache scalp hunter. Documentation is listed at the end of this essay. Emigrating from Ireland at 16, Kirker began his American career as a privateer during the War of 1812 fighting the British. After the war, James Kirker sought greater opportunities on the wild Southwest frontier in the Mexican province of New Mexico. He trapped beaver with a noted California pioneer and famous mountain man, George Yount, and was accused by his enemies of leading a band of Apache raiders. James Kirker made his headquarters in Santa Fe where he seems to have become friends with the first American settler in Contra Costa County, Dr. John Marsh. James Kirker played many roles in the Southwestern frontier. He guarded Mexican copper mines of Santa Rita against raiding Indians. He was a friend of young Kit Carson and found him a job at the mines. Kirker organized militias in many of the villages in Chihuahua State against growing Apache attacks. Later James Kirker led a large band of Mexican, American, Delaware and Shawnee warriors. They fought the Apaches who were raiding deeper and deeper into northern Mexico. Kirker's band was just one of many such mercenary gangs of American and Mexican Apache scalp hunters working for the State of Chihuahua. However there is no evidence that Kirker personally took scalps himself. Even though a naturalized Mexican citizen, in 1846 Kirker quickly switched sides and fought for the Americans during the Mexican – American War earning a large price on his head as a traitor to Mexico. James Kirker arrived in California in the spring of 1850 from Saint Louis via Santa Fe and settled in Contra Costa County on the ranch boundary of his friend, John Marsh. A literate man, Kirker wrote an interesting account of being blown up in the explosion of the Sagamore, a San Francisco Bay steamboat, during the celebration of California statehood in 1850 (Kirker, 10/31/1850). Kirker lived for two more years in Contra Costa, dying of natural causes either in late 1852 or early 1853. Documents in the archives of the Contra Costa County Historical Society and the Contra Costa County Clerk’s office prove that much of what has been written in popular books and magazines about the final days of James Kirker is incorrect. Our historical archives now reveal the real location of James Kirker’s Contra Costa home. Slocum (1882) states that Kirker lived at Oak Springs but failed to identify the exact site. McGaw (1972), in a popular biography of James Kirker, shows a fuzzy photograph of a group of palm trees supposedly located at Oak Springs (p. 212). The 1976 Historic Resources Inventory, Contra Costa County places Oak Springs at Buchanan or "Turn Around Park," approximately three miles south of Pittsburg. This may be because the park is near the northern end of Kirker Pass with a natural spring for farming and cattle raising. This interpretation is incorrect. 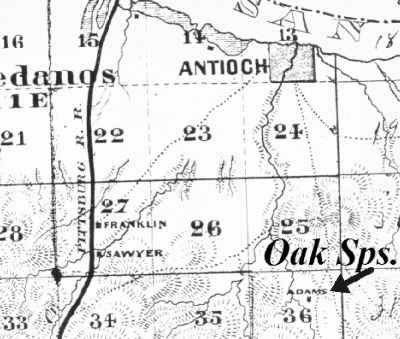 Slocum (1882), writing about the history of the Antioch area (p. 484), stated that a Doctor Samuel Adams acquired the Oak Springs after the death of James Kirker. The Contra Costa Tax Assessor Book, 1860 – Antioch lists "Samuel Adams, residence, Oak Springs, Township 3." The Contra Costa County Tax Assessor Book – 1865 states "Samuel Adams: on land in Township 3 known as Oak Springs property near the road leading from Antioch to the Teutania Coal Mine." The Contra Costa County Tax Assessor Book – 1877 notes "Samuel Adams and Hauxhurst co-owners of 400 acres south of Antioch in sections 36 & 25, T2N, R1E. The State Geological Survey 1871 Topographic Map of Contra Costa County shows the Adams residence three miles due south of Antioch in section 36, T2N, R1E . A deed in the County Clerk’s office (Book 27, pages 207-208) and dated 08/01/1874 recorded 80 acres sold to a M.H. Booth by "Samuel Adams of Oak Springs." 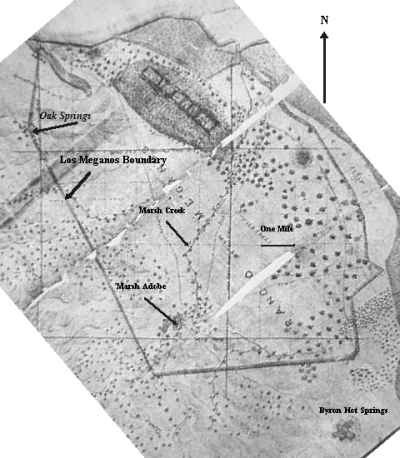 Oak Springs was noted on the deed as located in section 36, Township 2 North, Range 1, Mount Diablo Base and Meridian. Other deeds of sale (Book 27, p. 309, Book 32, p. 226, Book 34, p.104 and Book 41, p. 475) confirm that Oak Springs is in section 36, T 2 N, R 1 E.
The first official survey of the Marsh Rancho in 1853 by J.E. Whitcher shows that the rancho boundary passes through section 36, T2N, R1E. Kirker’s Oak Springs home is within the Marsh ranch. A comparison of the current United States Geologic Survey topographic map to the 1871 State Geological Survey map places the old Kirker Oak Springs home site as a few hundred feet northwest of the present Antioch Municipal Reservoir located approximately three miles south of Antioch. As a neighbor and friend of Dr. John Marsh, the old gunslinger may even have helped defend the Los Meganos Rancho against the growing numbers of rustlers. Kirker was reputed to have also been running a few head of cattle (McGaw, 1972). Abby Marsh writes to her family on April 18, 1853, "…Little more than two years or so," (therefore around 1851) "four men were hung for stealing the Doctor’s and another man’s cattle." (perhaps Kirker’s?) "We now have less stolen every year…" (Abby’s Letters, Bancroft/John Marsh Historic Trust). A friendship formed many years ago in New Mexico could explain why Kirker picked Contra Costa County and settled on the edge of Marsh’s remote ranch. One of the most popular myths about James Kirker is that he lived with six or seven tough Shawnee and Delaware warriors at Oak Springs (aka White Oak Springs). They supposedly followed James Kirker from New Mexico and made a living hunting wild game on Mount Diablo for the tables of San Francisco. When Kirker died in late 1852, the story commonly printed is that the fierce, heavily armed Indians solemnly gathered at Kirker’s gravesite on the hillside at the Somersville cemetery and then much to the relief of their worried, white neighbors, mounted their horses and rode east never to be seen again (McGaw, 1972) (Smith, 1999). How did this romantic story originate and why do so many different authors repeat it when the real facts could be so easily checked? As it turns out, an "old timer" is the only source for this wonderful tale. In 1964 the California Native Daughters of the Golden West put on a "Pioneers Picnic" in Contra Costa County. The gentleman was nearly 90 years old at the time and entertained his audience with stories that his father, a Somerville coal miner, had told him about James Kirker. In fact he said that his father during his coal mining days knew James Kirker "personally." However, contrary to what has been published (McGaw, 1972 & Smith, 1999), the official 1852 Census Records in the Contra Costa County History Center archives shows that there were no Indians living with James Kirker. There were seven men, including Kirker, whose occupation was described as "hunters" but they were all listed as White adults and United States citizens. With few exceptions, Indians were not listed as citizens of the United States until 1924. The census boxes that were available to be checked for Indians, Negroes, and "Mulattoes" are blank. Both McGaw and Smith repeat old gentleman's tale that Kirker was either buried in Somersville Cemetery or in Pleasanton behind the police barracks. Unfortunately facts keep getting in the way of a good story. Romantic tales aside, the historic timeline is wrong. James Kirker died eight years before commercial coal mining began in Contra Costa County so it is unlikely that the old man's coal mining father would have known Kirker "personally." As for the "hillside" cemetery at the Somersville mining camp (referring to the Rose Hill Cemetery), it did not exist when James Kirker died. In fact Somersville didn’t exist in 1852. Therefore there was no band of hard-bitten, Apache fighting, Indian warriors available to bury James Kirker at a non-existent "Somersville" and then ride off into the sunset never to be seen again. Original court documents in the Contra Costa County History Center archives prove that rather than Kirker's companions riding away, several of his white hunter companions remained for years in eastern Contra Costa. One can find their names in legal cases as both witnesses and defendants ranging from assault, land disputes to illegal woodcutting. In addition, none of the burial sites (including Live Oak Cemetery) cited in the published literature are based on any verifiable evidence. Today the location of Kirker's grave remains a mystery. Then why are these burial/Indian stories repeated when the facts are so easy to check? Probably because the tales portray such a wonderfully romantic story of the old west that historians have suspended critical judgment. Writers quote earlier publications and fail to check the census records and timelines for themselves. Then the story becomes a self-perpetuating myth of circular quotations. The "old timer" claimed that his father knew Kirker "personally" and believed that James Kirker "was a bad man." This often quoted "fact" comes only from him and may reflects our own 21st century values. There is no historic evidence that Kirker was considered a "bad man" by his contemporaries. Based the history of the area, it is unlikely that the old man's father ever knew James Kirker. But there is documented evidence from the archives of the Contra Costa County Historical archives that James Kirker was considered to be a law biding, responsible member of the community. His contemporaries in New Mexico also spoke of him in complimentary terms. 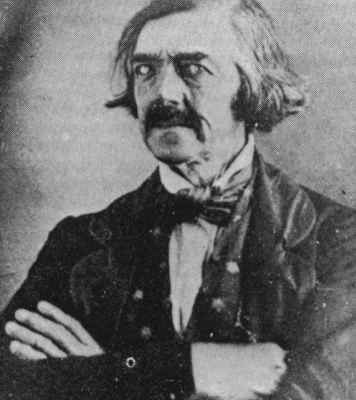 "Ordered that an election precinct be held at Marsh’s Landing on the San Joaquin River for the Township of New York at Marsh’s house at the next general election to be held on Tuesday the 2nd day of November 1852. That John Marsh be appointed Inspector and James Kirker and Daniel Kendrick act as Judges of said election. Given under my own hand this 21st day of Oct. 1852. This is hardly the civic responsibility that would be given someone that the county officials considered a "bad man." It also is clear that James Kirker and John Marsh were neighbors, knew each other and could work together. By the 1850s mountain men like Kirker were romantic figures representing a period of western adventure that had past. Here in the Far West his exploits in the Mexican – American War and as an Apache fighter made Kirker famous and admired. As early as 1854 or 1855, a petition to the Contra Costa Board of Supervisors mentions "Kirker's Pass" to be named in James Kirker's honor. In 1892 the Board of Supervisors formally voted to name the gap in the hills, Kirker Pass. By today's standards some of Kirker's reported Indian fighting tactics would be considered brutal. However during Kirker's lifetime and well into the late 1880s, the Apache raiders remained a cruel and terrifying threat to Americans, Mexicans and other Indian tribes alike. The real facts about James Kirker’s life in Contra Costa County form a good object lesson about writing local histories. First, as tempting as it may be, we should never uncritically accept the memories of "old timers" about people or events. Memories fade and stories become more elaborate as the years pass until the facts and the stories are only distant "cousins." Our elderly gentleman probably believed in the stories his father told him about James Kirker. It is probably also true that after each retelling the stories became more entertaining. Often the facts in popular books and magazines have been either been altered for "dramatic" purposes or poorly checked by authors and editors. Unfortunately, once an erroneous "fact" is published, it usually takes on a life of its own. Why is all this so important? It is important because as historians and those interested in history, we should seek only the truth about our historical heritage. Even though many of us are amateurs, what we write will be read and cited by others who may live far from our area and its primary sources. We all have access to federal, state and local archives. Therefore in our own research there is no excuse to repeat the same sort of mistakes that others have made about the last days of James Kirker. Bancroft Library/John Marsh Historic Trust, 1818-1855, Letters of Abby Tuck Marsh, Microfilm 2896. California State Geologic Survey, 1871, Topographic Map of Contra Costa County, Complied for the Board of Supervisors, Contra Costa County. California Census of 1852: Counties of Butte, Calaveras, Colusa, Contra Costa, Contra Costa County History Center, Martinez, California. Contra Costa County History Center Archives, Martinez, California. Contra Costa Court Records, Contra Costa County History Center Archives, Martinez, California. Jeremiah Crabb, 1854, 1860 (People vs. Roberts/Flinn). Contra Costa County Planning Department, 1976, Historic Resources Inventory, Contra Costa County, California. James Kirker, October 31, 1850, Alta California newspaper. This is Kirker’s own account of being blown up by the boiler explosion of the Sagamore steamship. McGaw, William C., 1972, Savage Scene: The Life and Times of Mountain Man, James Kirker, High Lonesome Books (originally published by Hasting House), 216 pages. Road Petitions of O.A. Olmsted, 1854-55, County Board of Supervisors, Contra Costa County History Center Archives, Martinez, California. Smith, Ralph A., 1999, Borderlander: The Life of James Kirker, 1793-1852, University of Oklahoma Press, 326 pages. Slocum, W. A., 1882, History of Contra Costa County, California, W.A. Slocum & Co., Republished by the Contra Costa County Historical Society, 1974, Brooks-Sterling Company, 710 pages. Whitcher, J. E., October 24, 1853, Survey of Rancho de Los Meganos, U.S. District Court, Northern District of California, Case 107.